Which one is Architecture – FEAF or FEA – Reference Model? Are reference models architecture? If not what are they? Is FEA – Reference Model designed based on Ontology? Is Taxonomy Ontology ? What is the difference between the two and which of them is of architecture significance? Why does FEAF exist when FEA Reference Model is recommended by OMB. OMB recommends using Federal Reference Models for Planning – that includes Transition Planning / Modernization Roadmaps. Can FEA – Reference Models sufficiently lend into Transition Planning? To accomplish Transition Planning – EA – CPIC – PMO Integration is necessary. Does FEA Reference model provide sufficient structure and coherence to adapt it for Capital Planning and also for Program Planning and Management? 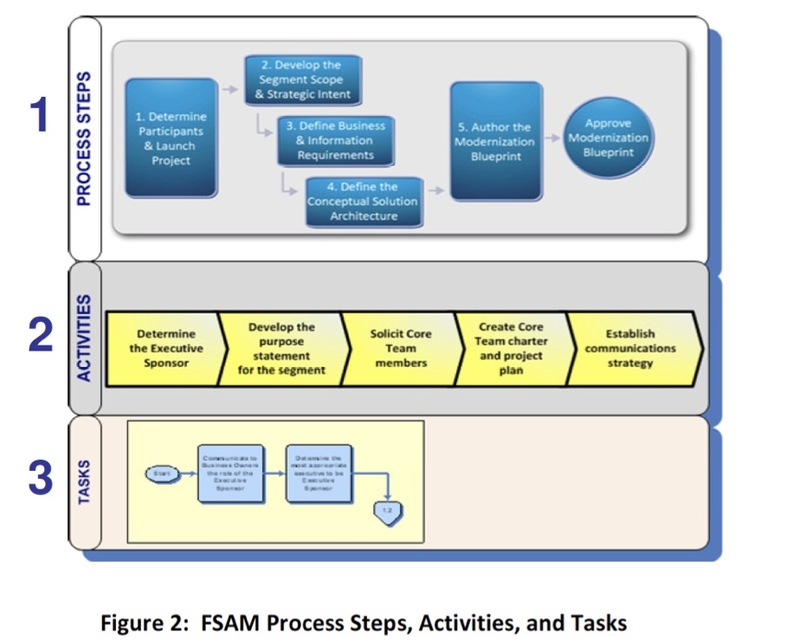 Does FEA – Reference Model render FSAM divisive or decisive? To what conclusions does FEA – Reference models lead while conducting EA Assessment? Does the above questions make Federal Enterprise Architecture a boon or bane? First of all “Segment” definition seems to be seriously flawed and riddled with “empirical dilemma” because of which it renders itself not anything architectural. It has confusing classification scheme that seems to follow no construct nor order. Schemes like this when applied to investment profiles, they seem more like apparition than anything real meaningful numbers on the Federal IT Dashboard. Also, it seems that there is unconscious fascism, underpinning the modality of bringing together people (architect ?? ) to define ‘The Federal Segment Architecture Methodology’ (Architecture??). Many times in such scheme of thing certain locational existence gives people “power” not necessarily genuine “purpose”. This provides authority to a certain group of people, who have no real cause nor motivation ‘Serving the Citizens’ in all humility. The term fascismo is derived from the Italian word fascio, which means “bundle” or group, and from the Latin word fasces; a fasces was a bundle of sticks used symbolically for the power through unity. The fasces, which consisted of a bundle of rods that were tied around an axe, were an ancient Roman symbol of the authority of the civic magistrates; they were carried by his Lictors and could be used for corporal and capital punishment at his command. Furthermore, the symbolism of the fasces suggested strength through unity: a single rod is easily broken, while the bundle is difficult to break. This is a familiar theme throughout different forms of fascism; for example the Falange symbol is a bunch of arrows joined together by a yoke. The new Federal Segment Architecture Methodology Link below. The New Guidance is still based on Federal Reference Models and the emphasis on Service Reference Model continues to exists. This means the ‘Reuse Plan’ continues to be based on SRM. Check out Step 4 under ‘Analysis’. Following inaccuracies in the OMB’s Reference Model and Segment Architecture Methodology – allows for inadvertently promoting bureaucracy in the agency’s OCIO rather than reducing it. To understand “reuse plan” with regards to agencies redundancy reduction planning it is worth establishing clarity between “empirical” and “analysis,” with regards to “common services” a term defined within the Federal Enterprise Architecture Reference Model framework that was established by the Office of Management and Budget (OMB). 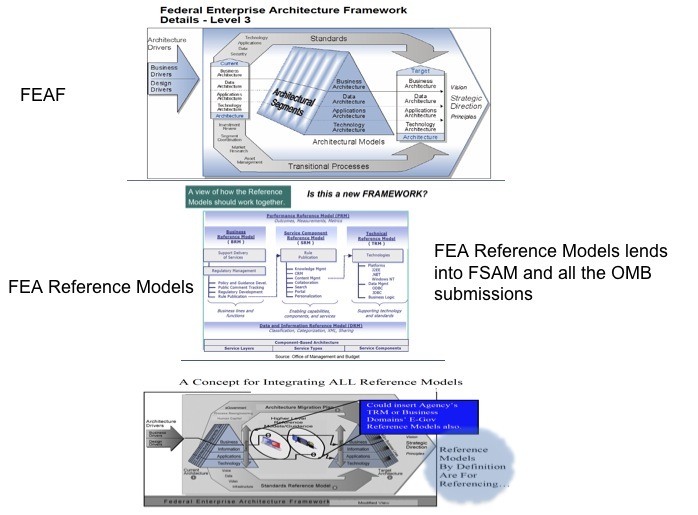 The Federal Enterprise Architecture (FEA) is a business- and performance-based framework designed to facilitate cross-agency collaboration, transformation, and government-wide improvement. The term “common services” defined within the Service Reference Model has an empirical notion. Meaning it is something that observed or experienced. It does not lend to analysis that is necessary to understand the system behavior, wherein the system is composed of components having ‘logical’ behavior that can be created in a componentized manner. With this as the basis it must be concluded that during the application of the notion ‘common services’ in the reuse plan, it is merely applied in the empirical sense, although the intension is to eventually drive the results derived into analytical perspectives that is useful for designing technical reusable components across agency line of businesses. Although the Service Reference Model is useful for conducting planning to achieve reuse across (intra) agencies by means of exploring common services, it does not lend satisfactorily into logical architecture analysis for an (inter) agency. Especially that analyzes the “business–to–system” and “system-to-system” interactions that uniquely fulfill a business sub-function. It must be noted that when the enterprise architecture migrates towards Services Oriented Architecture supported by infrastructure built upon the Enterprise Service Bus, the “system-to-system” analysis will be no more relevant as the interactions will be designed into a logical federated architecture. The notion of ‘business services’, ‘enterprise services’ etc within the Service Reference Models are empirical and not analytical useful for any architecturally significant discussion. Especially with regards to Service Oriented Architecture (SOA). Although, SRM could be used as ‘conceptual’ models they do not satisfactorily extend into logical ‘SOA’ based constructs. OMB guidance introduces distortions in the big picture considerations deemed necessary for redundancy reduction planning in the segment architecture area. During redundancy reduction planning, if the segment architectures are individually attempted as per the agency business priorities, then there is always a lurking danger of planning the operational and tactical aspects at the segment architecture level that does not include the issues that impacts the overall agency. As enterprise architecture in its overarching sense is in the missing, although it is spoken in terms of reference models. Techniques within architecture can endow mind with great capacity. For instance “perspective” is one such great capability with which one can create accurate representations even being blind-folded. This is the power of the architecture as a discipline. Perspective was such a reckoning force that it triggered “Renaissance”. Read about Esref Armagan, who despite being blind has mastered art by developing ability for perspectives. Note: When the planning mechanism inherently relies on the ’empirical’ notions rather than rationality arrived from incisive analysis and design decisions, then ’empirical dilemma’ occurs. This also leads to cognitive dissonance. The ontology used to describe the architecture of the system riddled with ’empirical dilemma’ will be lacking in logical arrangement of their structure both in spatial and temporal sense. Furthermore, this contributes to the inaccuracies in the behavioral description of the system. When one speaks of a behavior, it must be presumed that something is being measured which makes it observable and hence it has a performance. When any behavior is observed, then what meets the eye and what meets the mind are two different perceptions. The intrinsic logic that contributes to the system behavior must always be sought rather than relying on the outer manifestations. It is the outer manifestation which typically is ’empirical’. Owing to issues like these, the Reference Models do not sufficiently lend themselves as Architectures. As the Wall Street melts down, so does the DC. One quick survey and it will yield how lacking many big institutions are. Catering to the IT market are bandied many large IT vendors. It is a cartel, that systematically eats out the tax payers money. The federal spending on IT system runs into Billions and Billions of Dollars. Check out http://www.usaspending.gov/. It is a systemic parasitic process. Large institutions like FDIC, etc have intentionally avoided any systematic process that would render the IT related spending into accountable and transparent scheme of works. Instead, they relied on process that would create obfuscation with the hope that their actions would go buried deep in the morass that complexities inherently would introduce. In the federal sector, The Clinger Cohen Act was established to bring in greater accountability in addition to several other things. Importantly Enterprise Architecture is the medium to be used for creating transparent plans. At FDIC at least in spirit if not in letter, policy was established to follow Federal Enterprise Architecture as the basis for IT Planning. But in order to allow unfounded agendas to progress unhindered by the accountability requiring process, internal circular was issued allowing them to cast aside the Federal Enterprise Architecture based mechanism that would bring the IT expenditure under the purview of OMB. The contentiojn was that they are not a federal agency but a quasi-federal enterprise, that functions like a private corporate. Similar such ham-handed approaches were taken at Fannie and Freddie. Hundreds and Millions of Dollars have been spent on IT touting modernization and transformative efforts. And, what do we see in the end? “”What’s amazing to me is that the administration seems a little surprised that Congress and the American people are not marching in lockstep with them on this and not fully appreciating the urgency. Going forward, that now Fannie and Freddie have directly come under Federal administration, hopefully accountability creating systematic process will be established based on the Federal Enterprise Architecture guidance, should they survive as behemoths.